We can’t really think of anything more trite than to blame our periods for our problems—our mood swings, our tears, our craving for chocolate—but when it comes to breakouts, we’re more than happy to write them off as an annoying byproduct of our cycles. But what do our periods really do to our skin? What’s going on that’s causing the cluster of whiteheads on our chins and that one big one that always seems to settle right on the side of the nose? In short: a lot. There are a lot of factors causing those unpleasantries, and it’s time to demystify them. Your skin’s changes around the time of your period are due to hormones, and the way they fluctuate before, during, and after menstruation. The average menstrual cycle is 28 days, or four weeks. During the first two weeks of your cycle, estrogen is the most dominant hormone; during the second half, the amount of progesterone exceeds the amount of estrogen. Just before your period, as well as during, estrogen and progesterone both drop to their lowest levels of the cycle, while testosterone remains at a constant level throughout the month. And how does all of this hormonal mayhem affect your skin? Well, let’s break it down. Around the 14-day mark, your progesterone level rises considerably over your estrogen level, which triggers the production of sebum, the oil within your pores. This surge in progesterone shrinks the size of pores, which we’d usually think of as a desirable effect, but because your sebum production is in overdrive, smaller pores means the oil and bacteria is more likely to become trapped within, causing breakouts and inflammation. Once you understand the science behind it, the increase of acne around your period starts to make sense—but that doesn’t mean it’s any less frustrating. 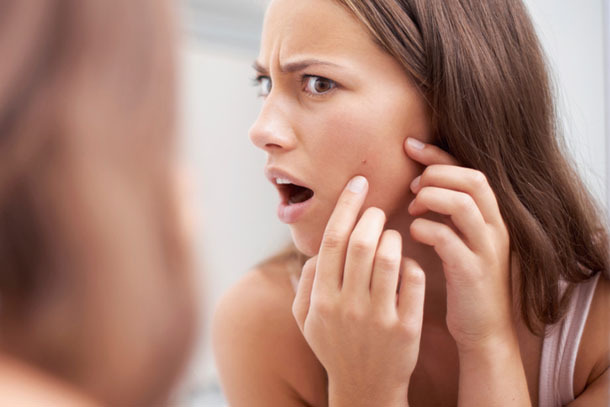 It’s totally normal for everyone to get breakouts during this time, but hormonal acne can become a real issue, particularly cystic cases, which is when many women turn to hormone-regulating treatments like birth control and spironolactone. But let’s get one thing straight: The vast majority of the time, your breakouts around your period have nothing to do with bad hygiene or an ineffective skin care routine, so don’t go scrubbing away or shifting around your products trying to figure out what’s wrong. It is, as annoying as it is, natural, so be gentle with your skin. It’ll be back to normal in no time… and then not so normal, like clockwork.